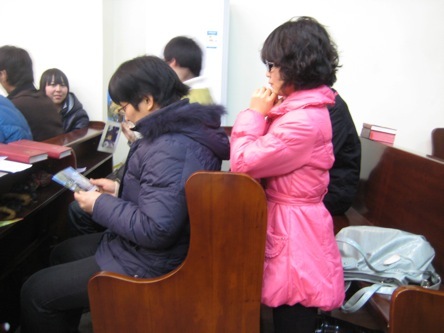 There are around a dozen churches in Hangzhou, a beautiful city about two hours drive from Shanghai. 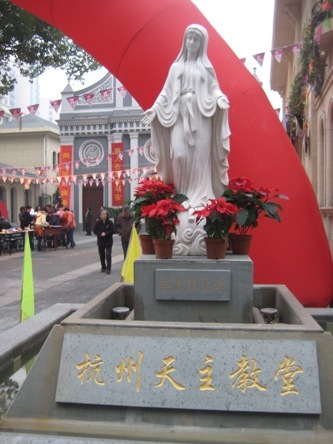 I came to Hangzhou Catholic Church (Hangzhou Tianzhu Church, as inscribed on the pedestal under a statue of Mary) at 4pm. 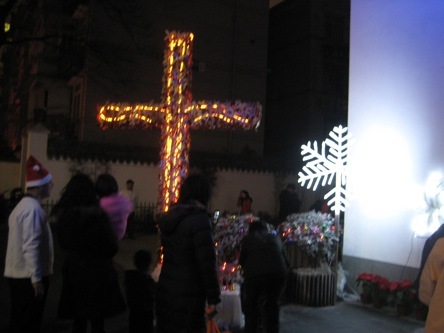 You know this is a church in China when you see red decorations everywhere on Christmas eve. 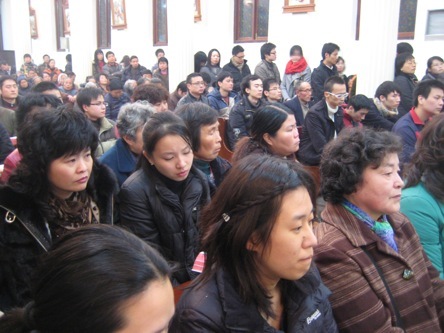 The Hangzhou Catholic Church just celebrated its 350 anniversary from Dec 7th to 8th. Originally built around 1659, the church is possibly one of the earliest establishment in China. During its 300 years of existence until 1950s, its priests have mostly been Italian, Portuguese and French. 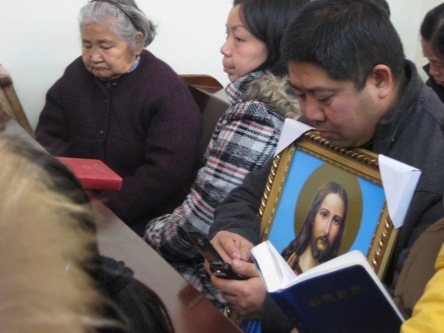 The first priest, an Italian named Lazoro Cottaneo, came to China to preach. He learned Chinese and Confucius classics to better preach the word of God. There were one English and one Chinese priest pre-Communist takeover. 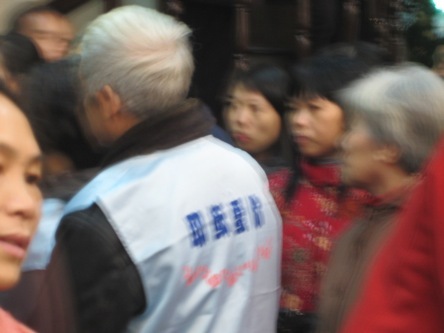 Since then, priests have all been Chinese, except during the Cultural Revolution when the church was shut down. People prayed before the evening mass at 6:30. 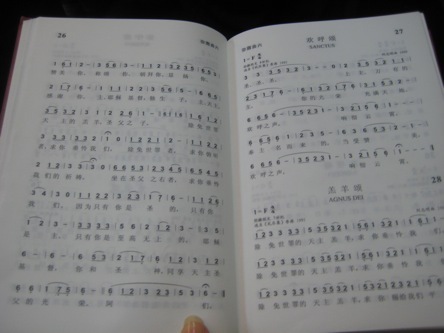 The hymnal used at the church. 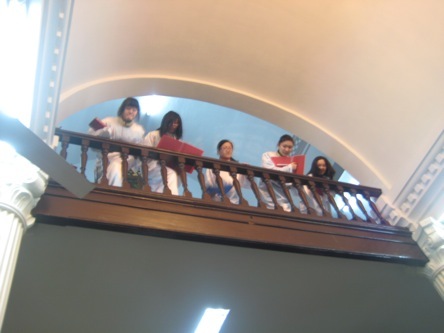 Young Chinese Catholics on the second floor looking down. On the old man’s vest, it says: Jesus loves you. The first two pews sat people who are about to be baptized. Overall, the gathering at the church encompasses everybody: young and old, peasants and city dwellers, students and professors, rich and poor. A man holding a portrait of Jesus Christ. Christmas eve mass in this Chinese church can be best described by Thomas Friedman’s new book title: Hot, Flat, and Crowded. The nuns and priests (sitting in a confessional with a long line of people awaiting) worked from 4pm to 8pm when I left. 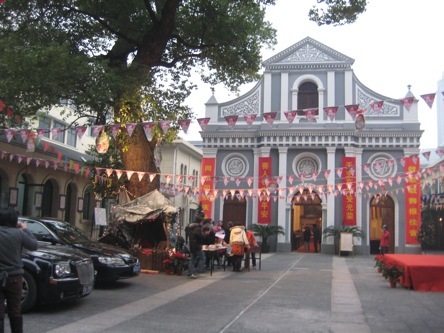 One block away from the Catholic Church is Hangzhou Tianshui Church, a church built in 1874 by Presbyterians from the U.S. John Linton Stuart, the father of John Leighton Stuart (former U.S. Ambassador to China from 1946 to 1949 and founder of Yenjing University, today’s Peking University), was once a missionary at the church. The church building was taken over by a factory during the late 1950s until early 1980s, when the church was converted back to a place of worship. It was renovated and opened anew this year to the public, with the design a mixture of western and Chinese influences. A big cross outside the church, a popular background for photos. Inside, a choir sang during Christmas eve mass. 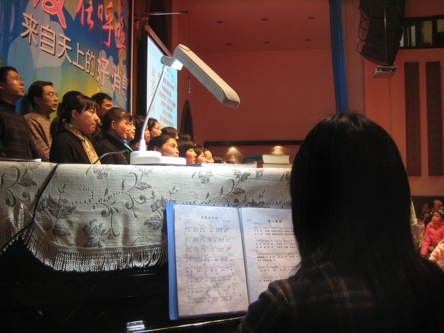 On the backdrop, it says “the good news from above.” Chinese churches are simple, and services are not as exciting. Not sure if there are any mega churches in China, probably not, but that would presumably attract many more young people. Did you say nuns were doing confessions? Also, there is one one church called Chongyi (崇一 in Chinese) in Hangzhou that I would definitely describe as a megachurch. Only priests were doing confessions. 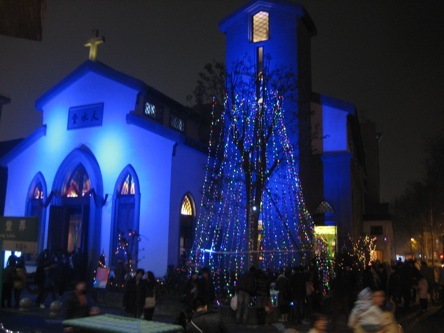 We will try to visit Chongyi church in Hangzhou in the future. Our research is preliminary and we may be too rush to draw conclusions. Thank you for your suggestions.